Is the Poppin File Cabinet the coolest colored file cabinet you can buy? It certainly won me over. 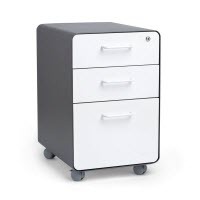 ​This sleek, modern, and (most of all) fun colored file cabinet will add personality and style to any office space. 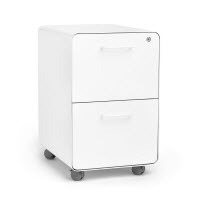 On this page I'll discuss the features, share some product specs, and tell you why this cool filing cabinet from Poppin might work in your corporate or home office. 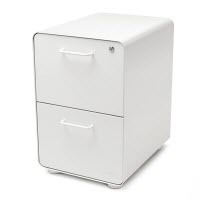 Available in both 3-drawer, and 2-drawer versions, and in a variety of colors ranging from all white, black, or charcoal to some of the colors pictured on this page (and many more), you can buy the Poppin Stow File Cabinet on Amazon. A fun, functional file cabinet, availble in a variety of colors from Poppin. 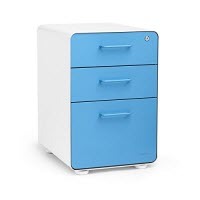 Why We Love It: If you're looking for a contemporary, fun colored file cabinet, we think the Stow Poppin File Cabinet will be an excellent choice. This short video will introduce you to the Poppin File Cabinet. From a purely functional standpoint, the Poppin File Cabinet is good. It works well, the drawers opened and closed easily, and seated well in the unit's frame. With that said, most people who will buy the Poppin File Cabinet will do so because of its unique, fun design, and not necessarily because it's a high-end file cabinet. ​People who purchase the Stow File Cabinet for this reason will not be disappointed with its look, or its functionality. The Stow File Cabinet from Poppin will fit perfectly in any contemporary or modern office space. It can be a fun way to accent your personality, and if you're a startup or small business, investing in Poppin File Cabinets (and matching desktop organizers) is a fun way to reinforce branding in your office with pops of color at every desk.